AMAZON’S MASTERPLAN FOR one Dublin data centre site could require as much electricity as a small city at times of peak demand. That’s according to planning documents submitted for the internet giant’s proposed new facility, which it hopes to build in Mulhuddart in north-west Dublin. According to plans submitted to Fingal County Council, Amazon Data Services Ireland Limited wants to build a 20,739 sq m (223,000 sq ft) data centre on the site. This is about three times as big as the pitch in the Aviva Stadium. It is anticipated that the centre will employ just over 30 people when it’s completed. Although the development has been approved by Fingal County Council, several parties have appealed this decision to An Bórd Pleanala. One of the reasons cited for why the centre should be refused is the huge amount of power that it will consume. However, Amazon has said that, if needed, it could build an additional seven data facilities as part of a masterplan for the 26-hectare site, which is owned by the IDA. The additional centres would all have to go through the planning process. Kenneth Matthews is the head of energy and infrastructure for Amazon Web Services in Europe the Middle East and Africa. He said in planning documents that the initial 223,000 sq ft facility Amazon wants to build in Mulhuddart “will require 35 megawatts (MW) of electricity”. Matthews said that this represents about 0.5% of the all-Ireland energy capacity based on projected 2020 demand. However, if the site is built out fully in line with the masterplan, Amazon’s full development “may require up to 205 MW of electricity”, he added. Matthews said that this would be “2.8% of the projected integrated single electricity market based on the latest projected system demand from Eirgrid in 2026″. However, he added that based on the “maximum projections on the annual energy usage from the proposed development … if the entire indicative masterplan were developed the projected energy usage would be 4.4% based on 2026 projected demand”. 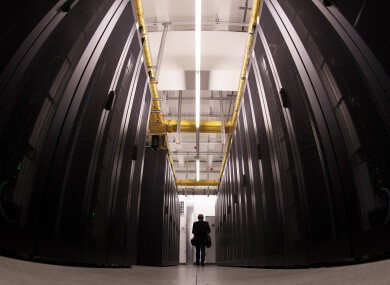 While it has been known that data centres use large amounts of energy, this is one of the first times that a company has laid out how much electricity one of their data centres could use. At a conservative estimate, 4.4% of Ireland’s electricity usage means that Amazon’s data centre development, if fully realised, would likely consume far more electricity than every household in a city the size of Waterford or Galway. In the planning documents, Matthews referenced the latest official forecasts from Eirgrid, which said that there is currently a surplus of generation capacity in Ireland’s electricity system – although this was expected to change as older electricity plants were decommissioned. As previously detailed by Fora, the semi-state grid operator predicted the country’s energy demands would shoot up over the next decade, primarily due to new data centres being built. It warned that a significant share of the data centre load was expected to be in the Dublin region, meaning “generation capacity or equivalent may need to be available … to accommodate this additional demand in the short-term”. Amazon plans to build a slew of data centres in the capital and already has several facilities in Tallaght. Amazon said in its plans that it had several strategies to help it meet its global target of fully powering its infrastructure with renewable energy. One of the most interesting is a proposal to purchase electricity from renewable energy sources that would not be supported by state subsidies. In theory, this could mean that third-party renewable energy projects could be built purely to support Amazon’s Dublin data centre. In recent years, Ireland has become a European data centre hub, with many companies such as Facebook and Google building the facilities here. The country is attractive for several reasons, including its cool climate and connectivity to the US via transatlantic data cables. Email “Amazon's grand plans for its new Dublin data centre could use as much power as a city”. Feedback on “Amazon's grand plans for its new Dublin data centre could use as much power as a city”.